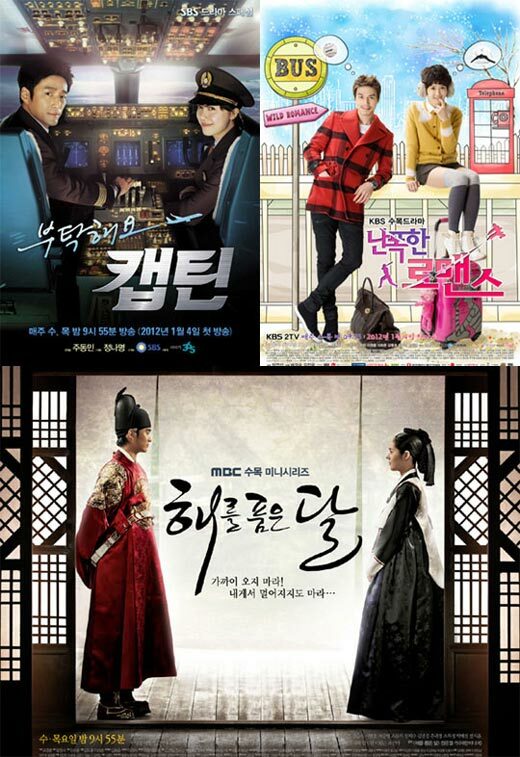 In the battle between three Wednesday and Thursday dramas of three major South Korean free-to-air TV channels, the MBC’s The Moon that Embraces the Sun is leading the field, SBS’s Take Care of Us, Captain’s ratings have begun to rebound, and only KBS’s Wild Romance‘s ratings continue to be slightly miserable. According to AGB Nielson Media Research agency data released on January 6th, 2012, the Wild Romance episode 2 broadcast on January 5th, 2012 only get the rating of 6.7%, down 0.4% from previous day. It’s the only drama among three broadcasters that suffered decline in ratings. The Moon that Embraces the Sun broadcast at the same time rose 1.9% to 19.9% national average ratings, while SBS Take Care of Us, Captain rose 1.3% to 10.5% ratings.